It’s time D-Heads! This week we kick off our Month-Long Very Merry Christmas Celebration Shows! 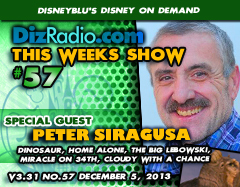 As the holidays draw near we have all kind of fun this week as we welcome voice actor veteran PETER SIRAGUSA (Dinosaur, Home Alone, The Big Lebowski, Miracle on 34th St., Cloudy With A Chance of Meatballs, Voice Actor) to the show! Peter is stopping in to talk about his career, those roles you know him for, his holiday favorites and classics, being part of Dinosaur and more! In addition we have the D-Team back as Ken comes back this week introducing you to some rare voices you may recall, different takes on some Disney Vintage Records and some great goodies in Walt’s Music. And Randy is here coming at you with the latest in Disney Multi-Media and Interactive treats. There is tons of news hot off the D-Wire from New Park Information, Blu-Ray releases, Behind the Scenes Movie News, The Walt Disney Company and more.